Dómur um sýningu Leikfélags Hafnarfjarðar á Ubba kóngi á Mondial du Théâtre e.
With „Ubu roi“, Alfred Jarry created a whole new universe to laugh kindly about the powerful and wealthy ones who are so protected usually. On stage they became a joke, locked in the ugliness of their vices; full of themselves, they don‘t have the ability to introspect. The Icelandic troupe perfectly understood that point and underline every character to his funniest state of ridicule, while colouring the play with their own identity and that drop of generosity and craziness we appreciate so much in their culture. 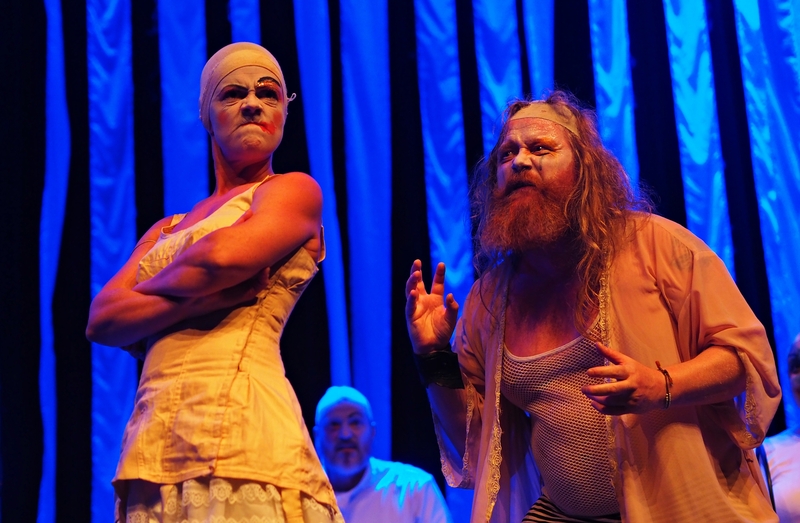 Jarry‘s text is such an homage to freedom of speech, irony, and grotesque, that it is almost a waste to do „Ubu roi“ in a classical way; so thank you to them for having that courage, it is for this type of show the festival of Monaco exists and also the reason amateur theatre stay surprising in comparison with the main one. The directing was extremely inventive using a lot of little comical tricks to create effects. The language wasn‘t a problem at all, actually it is the contrary; that let the spectator more available to catch all the details. In France we have an adjective since Jarry arrived with his „père Ubu“ and „mère Ubu“, it is „ubuesque“. So, this exactly what it was; a terrific, and „ubuesque“ show!